Welcome to Skyrim in Terraria! The world looks like Skyrim, it has towns, caves, dungeons, Inns, shops, jarls, castles, Bandits, Robbers. 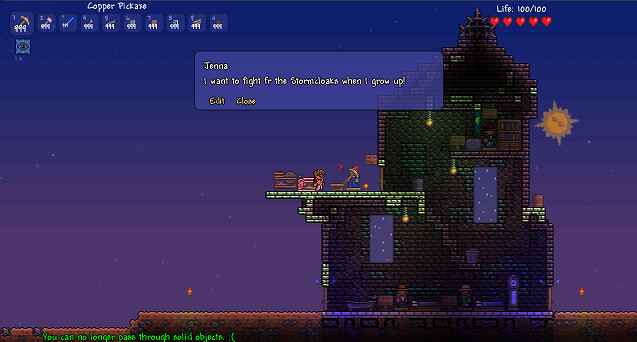 Yet it is Terraria! In this map you are placed as the Adventurer Gordon. You are free to explore the World of Skyrim, help, steal, murder, help, betray. It's your world! This map has no story line or main quests, it's all up to you! 1. No destroying or adding blocks unless told to or if it's on a property you own! 2. Only steal from chests with "Steal" next to it. 3. Use the buy option responsibly, pay the right amounts and put the money next to the item you bought. 4. Take items in quest chest only after you do quest, put any items you were suppose to retrieve in quest in the chest. 5. Don't steal characters clothes! Ever! 6. Follow the damn rules! Endless Fun! This is the best part! If things go to plan I will be able to update this map every 1 or 2 weeks, adding new towns, changing dialogue, quests, prices, and character development. What you can do - Play, comment, stay updated, post pictures of your house, leave suggestions for future towns, make videos, spread the word. Play it by yourself, on servers, with friends, for videos, for your self, if your bored with Terraria. Towns: So far Solemn - Solemn is very close to the center of Skyrim, due to that fact many shops are set up, also a lot of travelers pass through. The climate is warmish, no snow unless it's winter. Solemn sides with the StormCloaks. Friendliness rating = 4/5. There is 2 towns so far, Solemn and Gashling. But I plan to add a new Town in every update. Solemn has caves, stores, houses, a castle, a farm, a camp, people. What I plan to do: More shops - Mechanics, reforge More Towns - Add a new town in every Update More caves - Fill the world with caves! Sell option - Option to sell certain items More races - Add races like Kajit and others from Elder Scrolls. Creation Compendium - Add something from the weekly theme in Creation Compendium that gets featured every week. The current season is Summer. Guys new version is out - Version 5! The new version has a whole new town! The town name is Gashling and there is tons of new quests, people, and things to explore, enjoy. Thank you, Some guys are currently working on a mod for this map, so you can expect a mod to go along with this map in the future. it was really creative to think of the harpies as "dragons" and the giant glass bubble as a "shield." this is a pretty nice map. New Download, should be no Harpies while in town. the harpies are still a big problem. i can't play the map at all! tkx man. i can see this being a pretty cool map. Thank you so much for your time, the bugs are all due to the fact that this is just getting started. I've fixed those bugs and more in version 3. Be sure to stay updated for new content coming soon. Also I'll try to slope the world down from now on to get rid of the harpy problem. also, there is no chest next to the hotel owner to put the money in, or to get the key. there are quite a few mistakes in this map. also, WHY did you make the map so high up? i cant go 5 blocks without getting bombarded by harpies! i think i found a mistake. when that guy is asking you to deliver the gold sword to girdon, there is nothing in the chest next to him.